If you’ve ever visited outback Australia, you’ll realise just how a movie like Mad Max could come about. With nature’s brutal extremes an always-present reality, and dusty old Australian cars the only real means of transport, things tend to get rather apocalyptic very quickly. Now Sicily may seem a world away from this brutality, but remember that Palermo, Sicily’s capital, is actually closer to African desert than it is to Rome, and that the island has been subjected to thousands of years of invasions from many unruly southern hordes. Add this to the fact that the last Mad Max movie was actually filmed in Africa, and the parallels between Australian and Sicily start to make real sense. 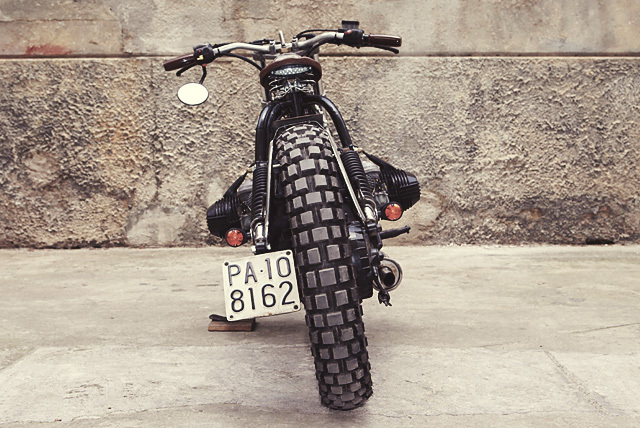 Channelling this, and adding a large dose of wine, women and food for good measure is Delux Motorcycles. 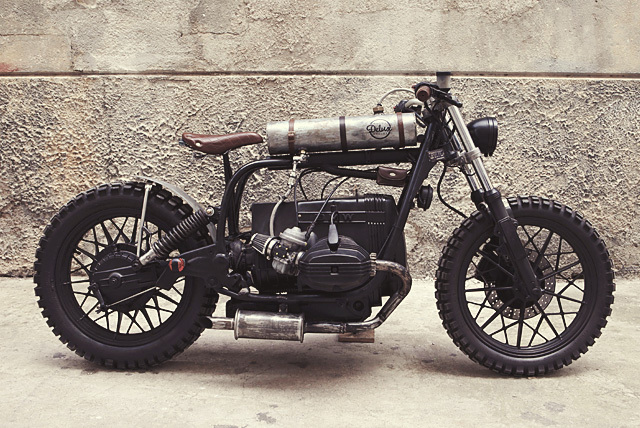 Here’s their latest, a BMW R65 they call ‘Mad Max’. 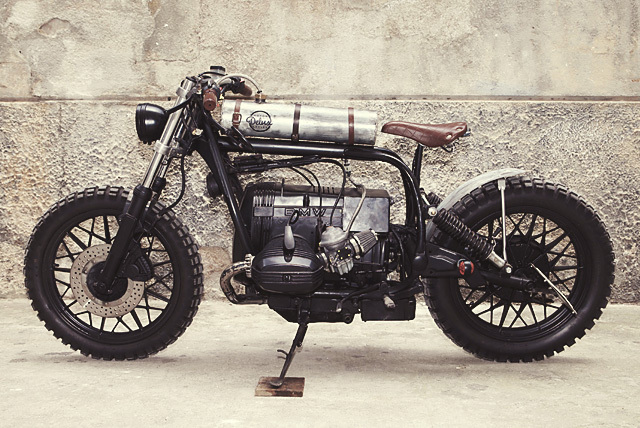 The bike started life as a ‘83 BMW R65. The boys informed us that although it had exactly 6 owners before they got their hands on it, it only had 45,000 kms on the clock. ‘We found it in an old barn, covered with tons of dust and rust. 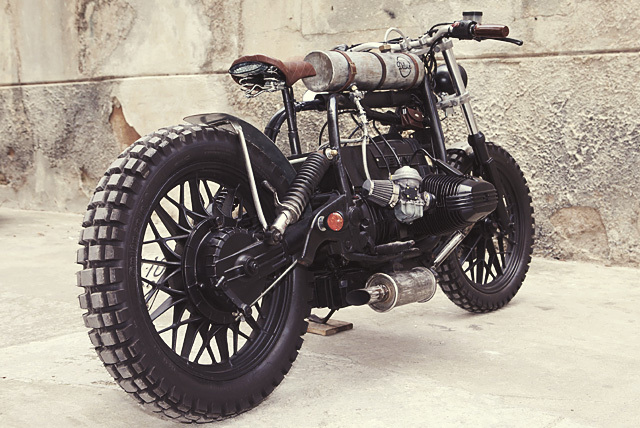 The guy was a farmer, and as the bike had a completely ambiguous set of tires on it, we can only assume it was being used on the farm for herding cows or riding over ploughed fields.” Needless to say, it’s been almost completely changed since then – bull dust and all. So the boys got to work. 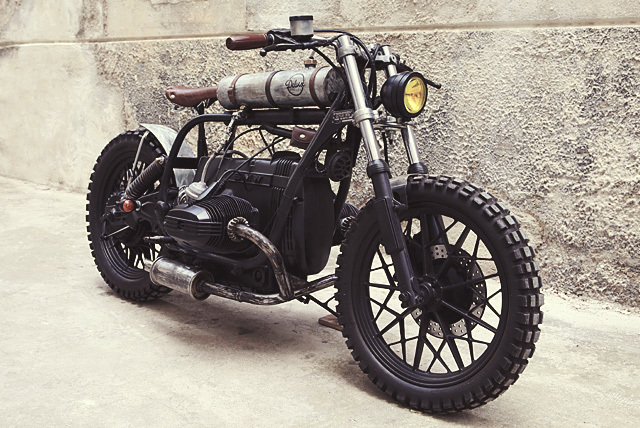 Their overarching thought was to approach the build in a similar way to a ‘Mad Max’ vehicle; that is to say by using pretty much anything the could get their hands on. 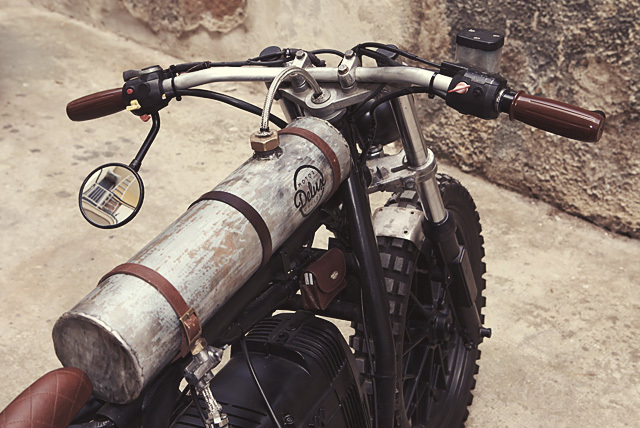 Or, as the boys say in their charming Italian way, ‘he is reborn of everything.’ Clearly the tank is the bike’s most eye grabbing modification, with a patina that can only be described as beautiful. And, as with most of Italy’s automotive endeavours, there’s that ever-present touch of the agricultural, too. The other guiding principle they stuck to was an unwavering attention to reducing the bike’s weight. ‘Essentially, we wanted it to look like a bicycle,’ says Massimo. ‘Compact, snappy, handy and overall, very simple. 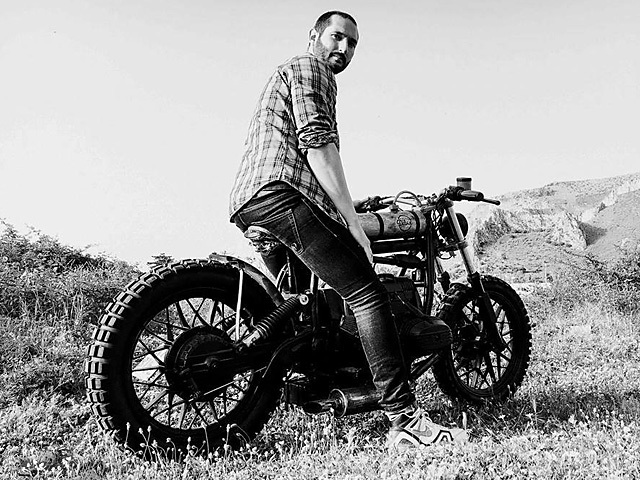 While the chassis and engine block remains largely original, Gabriele and Massimo changed the suspension and rebuilt the bike’s original shock absorbers. The headlight is a spotlight from a 90s Jeep, which has been repainted black and had yellow glass added. 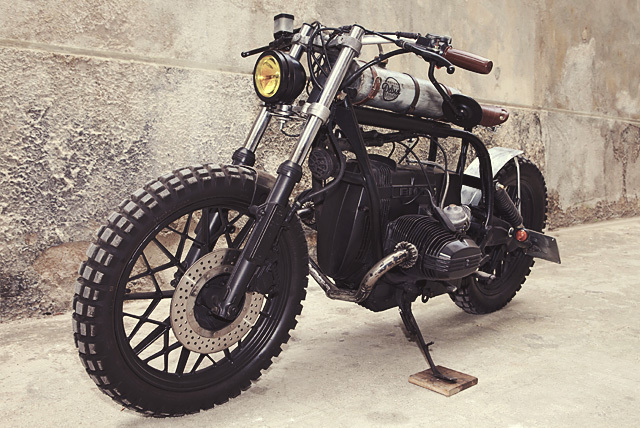 The tank was made by hand using a 60cm piece of water pipe. With a wall thickness of 10mm, we’re pretty sure it won’t be springing a leak anytime soon. And the tank’s cap and the fuel lines have been repurposed from their original duty as natural gas conduits, and mated to a petcock from a ‘70 CB Honda. Naturally, all of the bike’s metal has been left, um, natural. The bike’s saddle was sourced from Bernardi, a well-known Italian bicycle brand and creator of some of the world best vintage saddles. Holding it up is an old section of crowbar the boys found kicking around. No chance of that particular component bending under load, then. 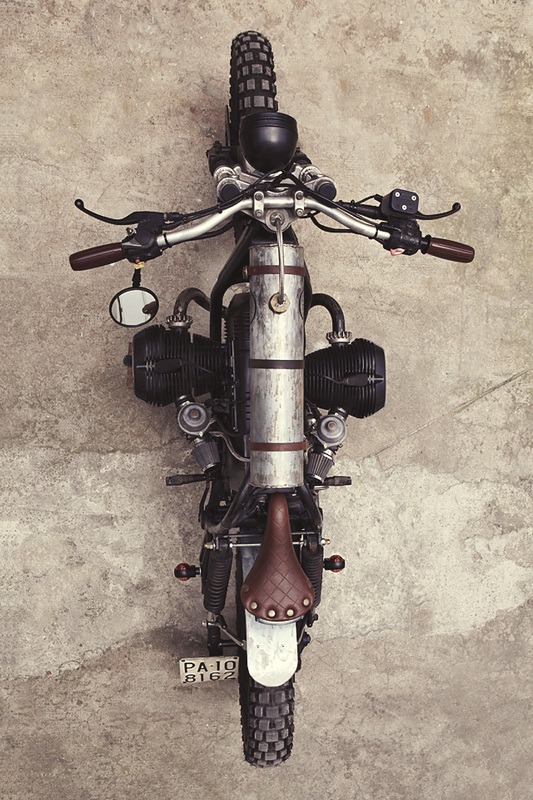 “We then removed all the bike’s electronics and instrumentation to make it even more streamlined and bicycle-looking. Any of the essentials left over were fed inside the bike’s frame to keep them hidden.” Also note the rough-and-ready box attached to the rear of the engine that houses anything that was too large be concealed. 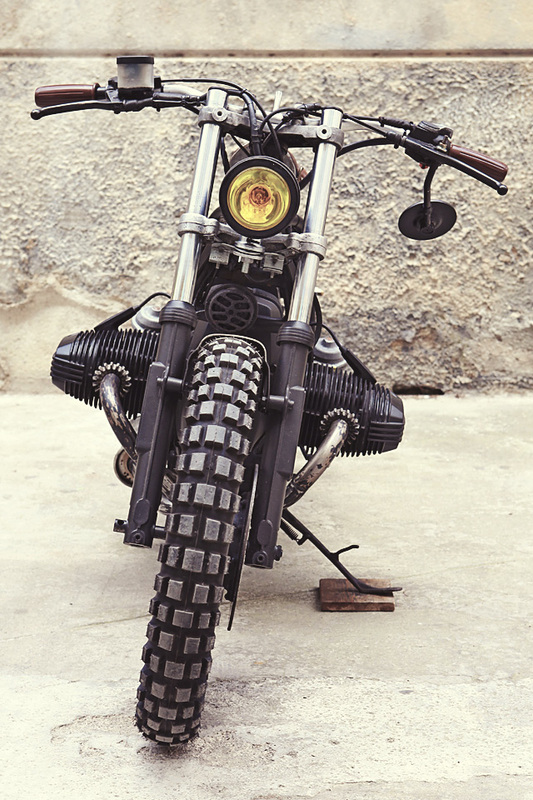 Finishing touches include a sweet set of handlebars from an ’85 Kawasaki Motocross bike and a hand-made muffler created with parts from an old fiat. Bellissimo! With the build done, the only thing left for the boys to do was enjoy their creation. We have it straight from the cavallo’s mouth that the bike is a hoot to ride and, as you often hear in regards to this style of leather bicycle saddles, much more comfortable that your downstairs mix-ups might imagine. We look forward to see what’s next from this powerhouse Sicilian duo – that is if they ever manage to stop riding this one.